Dragging a cord around while you listen to music can be a hassle. That's why wireless Bluetooth headphones are growing so quickly in popularity. In this article, we're going to discuss our top picks for the very best wireless headphones that money can buy. Wireless headphones can be beneficial not only for listening to music at home, but also for workouts, travel and any other time you need excellent sound quality without being limited by a cord. Starting with the Jabra MOVE, we're going to show you nine of the best wireless headphones in the market today so that you can find the ideal pair for you. Overall, it's going to be up to you which features are the most important when you buy a wireless headphone set. Many customers seek out wireless headphones that have a long-lasting battery life, that way they won't have to worry about charging them too often. Depending on your personal preferences, there are a number of headphones in the US market that will be able to suit your needs. In order to help further your search, this buyer's guide will offer you information on multiple wireless Bluetooth headphones to help you find the best one. 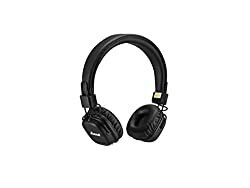 These headphones are made with leather earpads designed for comfort while you listen and a stainless steel lightweight headband you can adjust for the perfect fit. The matte-textured plastic on the earcups adds to the excellent black, red and cobalt designs available. With 8 hours of playtime on the Jabra MOVE Wireless Headphones, you won't have to worry about the battery running dry even after a long period of constant usage. You'll get to enjoy great sound performance using this headset, including balanced and crisp mids, highs and across bass sounds. The MOVE headphones' sound quality will surely impress. When the Jabra MOVE Wireless headphones need to be charged, you can find a plug in on the left earcup that can connect through a standard connector. The power switch for the device is on the right earcup. With the multifunction button, you'll also be able to play and pause audio with the touch of a button. With an 80mW speaker max input power and a 29 Ohm speaker impedance, you'll love the earcup speakers on the Jabra MOVE Wireless Headphones. While some may find the lack of noise insulation somewhat annoying, their quality and low price makes them the best wireless option here. ​While most customers have loved these headphones, there are a few who have experienced problems with the ear cups falling apart. Bluetooth pairing is quick and easy. Earcups may not fit all ear sizes. The Jabra MOVE Wireless headphones are comfortable and offer an excellent sound quality. 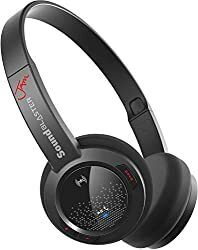 ​​If you're looking for a pair of great Bluetooth headphones for less than $50, the Creative Sound Blaster Jam Headphones are fantastic. As the company is more commonly for making sound cards, the sound quality on these headphones will be worth it. You may find that the earcup padding may be less than you might get from more expensive models with thick pads, but they still do a great job and you pay a cheaper price. The Creative Sound Blaster Jam Headphones come in at only 8.8Oz, giving you a comfortable, lightweight experience and overall quality that is very good. 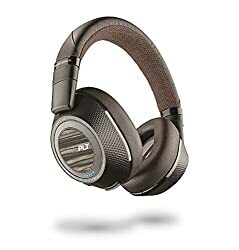 With the help of a 3.7 v 200 mAh lithium-ion battery, you'll get a decent battery life and easily be able to charge these wireless Bluetooth headphones as needed with an included USB cable, which is a one meter cable. When fully charged, you can get up to 12 hours of usage which can be great for travel. You'll also be able to get a range of 30ft with the connection via Bluetooth 4.1 and NFC, which will give you the freedom of moving without a cord. These wireless Bluetooth headphones offer a great sound through the use of the Neo Dymium drivers, which help create great bass and treble. You can even increase the bass quality with the bass boost switch. The mids will sound excellent as well. Do keep in mind that the sound quality can be effected when turning up the volume. Without a doubt, these headphones are made to offer good value at a very low price. These headphones sometimes cease to work properly with only a few months of usage so make sure you're familiar with warranty, return and replacement information. When you're looking for something that will save you money without having to sacrifice on quality, the Creative Sound Blaster Jam Headset is the way to go. ​​These noise-canceling headphones are one of our favorites in the realm of tech gadgets. Sennheiser's PXC 550 headphones are excellent for travel. They have a compact design and great sound quality, designed to make your travel listening easy. The PXC 500 headphones are high-tech in a lot of ways. They offer the ability to swipe up or down the back of the earcup when adjusting volume, or side to side when you want to change song tracks. You also don't have to press the power button to turn them on. By turning the right earcup upward, the headphones will automatically turn on and connect to one of the two Bluetooth 4.2 signal pairs that it's able to remember. The battery life on the PXC 550 headphones is also incredible. With a 30 hour battery life for continuous usage available, you won't have to worry about them going dead on you in the middle of a trip. When these PXC 550 headphones do need to be charged, you'll be able to do so using a micro USB power port. They also offer noise cancellation, which makes them a great transport choice because they'll block out the sounds of people around you. While they offer a great sound with regard to sound quality, the bass may be lacking in the PXC 550 headphones, which is unfortunate for heavy bass users. Try them on as soon as possible if you buy these headphones, because customers have had problems with the fit being too tight. Bluetooth connection can fade in and out. May not fit all head sizes. 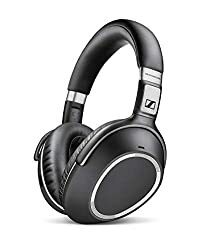 If you're on the go a lot and need headphones that can keep up with you, the Sennheiser PXC 550 Headphones are a great choice. 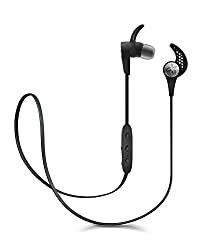 ​​Are you sick of earphones that are ill-fitting and fall out of your ears during a sweat session? If so, then these Jaybird X3s will surely be able to fix that problem. These earphones come with three differently sized silicone ear tips as well as fins to help make sure they don't fall out while you job or lift. On top of the great fit, these earphones are also sweatproof, so you won't have to worry about them being damaged whether you're lifting at the gym or running in the rain. No workout will disturb the fit on these earphones. You'll be able to get that workout body while enjoying the balanced bass and bright highs that the in-ear headphone speaker design on the Jaybird X3 headphones have to offer. These earphones also have a great fit while worn under a helmet, which is highly convenient. When your workout is over, you'll also be able to connect them around your neck to wear like a necklace. While they don't have the R and L indicators, they do offer a well-balanced sound that you'll be able to adjust to your own preferences using Jaybird's MySound App. With the help of the 100mAh battery, you can also enjoy up to eight hours of continuous playtime. If that's not enough, these earphones can also be easily paired for wire-free freedom. You'll be able to enjoy convenience and great sound quality all in one tiny package. ​A number of customers have found that while these headphones typically work great indoors, the Bluetooth connection may often fail outdoors. Work great for voice calls. Problems with the Bluetooth connection. Speakers may cut in and out. If you want something heavy-duty and don't mind paying a little more, then the Jaybird X3 Headphones are a great choice. ​When you need wireless headphones that are going to be long-lasting, look no farther than the Marshall Major II headphones. With these, you'll be able to get an incredible battery life, giving you over 30 hours of playtime from just a single charge. These are a comfortable set of headphones that are especially great for listening to your music for long periods of time. Like other wireless options, you'll be able to sync these Bluetooth aptX over-ear headphones with your smartphone, allowing you to use them in place of your phone to reject and end phone calls easily. You'll also be able to easily control your music using an easy knob located on the right earpad. These headphones are made to offer a great frequency range that help to create excellent sound. Marshall's design also allows you to easily recharge the battery on these headphones using a USB charging cable. This headset also pairs easily with just about any Bluetooth device, giving you wire-free freedom. ​Keep in mind that some customers have claimed to receive a fake product when ordering them online, so make sure to check the pair you receive if you purchase them to make sure they're authentic and work well. Some customers have received fake product. The Bluetooth signal may fade in and out. Overall, the Marshall Major II headphones have a lot to offer. They have excellent battery life and are highly comfortable. ​Many customers find noise-canceling headphones to be their favorite, because they do a great job of blocking out noises around you whether they're the sounds of other travelers or the office. When you want a pair of these headphones that can also offer great comfort, then the QC 35 headphones are a fantastic option. With their oval ear cups, these Bose headphones are able to keep you comfortable for even the longest listening session. Between the excellent sound quality, battery life and ability to block out unwanted noise, there's plenty to like about the QC 35 headphones. 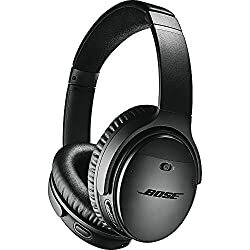 When you discover the noise-canceling and digital equalizing system features on the Bose QC35 headphones, you'll undoubtedly want to trade in your old wired headphone set for a wireless pair. The key feature for the Bose QC 35 headphones is in the microphones that you'll be able to find on both the insides and outsides of the two ear cups. These ear cup microphones are constantly listening for unwanted noises and cancel them out with a balanced sound to allow your listening session to focus on the music rather than disturbances. Unlike other models, the QC 35 headphones also feature a great rechargeable battery rather than the old AAAs. Another fantastic feature is the well-padded ear cups that will create the utmost comfort while you listen. They also create top notch wireless Bluetooth sound that is sure to be unlike what you'll find with other models. ​A number of customers have experienced issues with hearing or being heard well during phone calls when using these headphones. Offers Google Assistant voice commands. Microphone too quiet during phone calls. The Bose QuietComfort headphones are made to be top of the line products, so when you want something that will offer the best possible quality, these are a great option. ​If you're an audiophile seeking a pair of wireless headphones with the highest sound quality, then the Bang & Olufsen headphones are going to give you the greatest value for your money. With their 40mm electro-dynamic drivers, they can provide you with crisp mids, high clarity and an overall balanced and rich sound. Alongside the great sound quality, you'll also find the Bang and Olufsen headphones to be highly comfortable. They have a headband that is made with real lambskin leather. The memory foam earpads will also help to block out sound alongside the active noise cancellation feature. 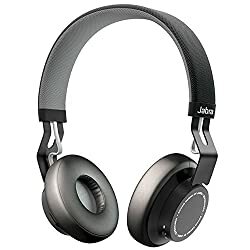 Many say that the sound quality holds up while using the Bang & Olufsen headphones via a Bluetooth connection, but you can use them as wired headphones as well when you choose. With up to 19 hours of playtime per charge, you also won't have to worry about a poor battery life. Overall, the design of the Bang & Olufsen headphones upholds the quality that many have come to expect from the company. ​Customers have had problems with getting these to connect to all Bluetooth devices. Not always a comfortable fit. If you're an audiophile who wants the best possible sound quality, the B&O Wireless Headphones are a great choice. ​​The active noise-canceling mode on the Plantronics BackBeat PRO 2 headphones are excellent for blocking out any ambient noise that may be floating around the environment. Their ability is absolutely perfect for those who work in a busy office filled with talkative co-workers and want to be able to enjoy their music in peace. The PRO 2 headset has a lot to offer, including the sensor feature, which pauses your music when you take off the headphones. Once you put them back on, you'll be able to enjoy the crisp highs and natural mid-tones as well as a deep, rich bass without having to push a single button. You'll also get a great 24 hour battery life. When you need them, you'll find the handy controls available right on the earcup, which can beneficial for voice calls as well as listening to music on the PRO 2 headphones. When you want to, you can also use them as wired headphones so you won't have to worry about the battery at all. While the PRO 2 headphones may be quite a bit more expensive than the Creative Sound Blaster Jam headphones, they are more comfortable to wear and offer improved sounds. ​Some who have tried out these earphones have found that the Bluetooth signal cuts in and out, or that they don't block out noises very well. Noise canceling feature can have problems. Audio may cut in and out. If you want something that will block out noises while keeping you comfortable, The Plantronics Wireless Headphones are a great option. 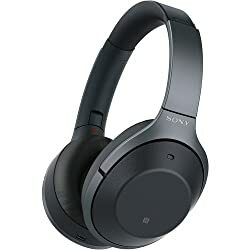 ​​If you want the very best noise-cancellation technology, then the Sony WH1000XM2 Headphones are an excellent choice. This pair of wireless headphones offers a great sound quality as well as a battery life of up to 30 hours. The favorite feature of these wireless headphones is the awesome noise cancellation. They offer not only active noise canceling, but multiple modes that are capable of focusing on canceling out different tones. They also come with a carrying case and an adapter for airplane travel. They do come in at a higher cost than the BackBeat Pro 2 headphones, but offer much more in the way of noise-cancellation to make up for it. ​Make sure to test these headphones out well, as some customers have noted odd buzzing sounds that aren't supposed to be part of the design. Odd sounds in the background. When you want top-notch sound quality and noise-cancellation, the Sony Noise Canceling Headphones are an ideal option. Each of the headphones in this list have a lot to offer in the way of wireless Bluetooth technology and quality audio. Many of them are also capable of fantastic active noise-canceling features that can help you focus on your music rather than the disturbances around you. Largely, it's going to be up to you which pair of wireless headphones will be best. You may want to keep in mind whether you on-ear, over-ear or in-ear headphones, as each can feel and function a little differently. Also make sure to take into account the kind of battery life you may need.